Home Nigerian News Soludo Speaks The hard facts to rescue the Nigerian Economy. Soludo Speaks The hard facts to rescue the Nigerian Economy. Let me thank the News Media for inviting me to lead the discussion on “The Hard Facts to Rescue the Nigerian Economy”. As I reviewed three of my recent interventions on the economy (“Buhari vs Jonathan: Beyond the Elections” (January 2015); “Can a new Buharinomics Save Nigeria?” (November 2015); and “A Fragile State with a Failing Economy: Making Progressive Change work for Nigeria” (August 2016)) as well as the plethora of expert opinions, conference communiques, lectures, memos and blueprints that adorn our media on daily basis, I am not really sure what else to say. Implicit in the choice of topic is that Nigerian economy is in dire need of a rescue, and many would agree. Let me frame the context of this rescue agenda with quotes from two voices that must know what they are talking about. On the state of the nation, the distinguished Elder statesman, Prof. Ango Abdullahi sums it this way (12th February, 2017) “Nigeria’s project is not working, after 50 to 60 years the Nigerian project is not working despite everything we went through, constitutional conferences, the country is at a standstill . It is unfortunate we are still where we were more than 50 years after independence and have not been able to move away from where our colonial masters left us”. On the performance of the government that Nigerians have entrusted to rescue the situation, one of the shinning lights of that ‘Team Nigeria’ has the following to say (Memo to the President which is circulating: I have received it from three persons —not from El-Rufai): These inherited problems were aggravated by the continuing slide in crude oil prices and the renewed insurgency in the Niger Delta that reduced oil production by more than 50 per cent!. We have no such clear roadmap at the moment…. In my honest opinion, we have made this situation worse by failing to be proactive in taking some political, economic and governance decisions in a timely manner. In very blunt terms, Mr. President, our APC administration has not only failed to manage expectations of a populace that expected overnight ‘change’ but has failed to deliver even mundane matters of governance outside of our successes in fighting BH insurgency and corruption. Overall, the feeling even among our supporters today is that the APC government is not doing well……(Gov Nasir el-Rufai: September 2016). The key point of Ango Abullahi is that Nigeria seems to have been moving in circles since independence, while el-Rufai, in a rare patriotic duty, makes a frank wake up call to the President and the APC. But there is a piece of good news. Finally, the Federal Government of Nigeria (FGN) now has an “Economic Recovery and Growth Plan” (ERGP) which is supposed to be its blueprint for rescuing the economy. I commend the effort. At least we now have something to frame policy discussion, and how we wish that this lecture and discussions are centred around an evaluation of the new Plan: Is it a plan for transition to post-primary commodity economy or more of the same? In other words, is this plan the response to both Ango Abdullahi and el-Rufai as well as millions of other patriotic Nigerians who have called for a sense of direction to the ship of state? That will be for another day! II: The FGN Response and Report Card So far? To be fair, it bears repeating that the FGN inherited a bad economy. By May 2015, the FGN was already borrowing to pay salaries and about 30 states had challenges meeting their salary obligations. The previous government had an unprecedented rate of debt accumulation even at a time of unprecedented oil boom, and was even depleting our foreign reserves instead of more than doubling or tripling what it met (it could have more than doubled the reserves if it grew it by just 50% of the rate of growth for 2004-2008); etc. Oil prices were falling, and disruptions of output in the Niger Delta made matters worse. Of course, insecurity especially in the North East was very high, and corruption was pervasive. The situation called for a state of emergency, with a progressive rescue team that could run at the speed of 1000 kilometres per hour to halt the drift and lay the foundation for a post-oil economy. Most Nigerians acknowledge the FGN’s efforts in fighting insurgency (Boko Haram) and corruption. On the economy, it has implemented the Treasury single account (TSA) although we believe that it could have been implemented better without squeezing the economy of the much needed liquidity at a time of recession; payroll audit and discovering thousands of ‘ghost workers’ (every government discovers these ghost workers); and a mishmash of command and control measures, demand management and exchange rate controls – all of which have wreaked havoc on business confidence and private investment, massive capital flight and driven the macro economy into recession. Most macro variables have worsened significantly: inflation (from 9% to 19%); exchange rate (from 197/215 to 305/465); unemployment (from 7.5% to 14%); GDP growth (from 2% to -1.56%); market capitalization of NSE (from N11.658trn or $54.2 billion at parallel market rate to N8.658trn or $18.6 at parallel market rate— with daily trading down from around N11billion to N1 billion or less, i.e., about $2 million); poverty escalating; and youth agitations increasing. Business confidence remains very low at (-29) while competitiveness index remains a low 3.39 points and ranked 124th in the world. Foreign reserves remain depleted and the current account balance remains negative. Savings- investment rates are very low and Sovereign credit ratings worsened. Nigerian workers have suffered a double whammy: average nominal wages are declining while real wages dramatically shrunk (with high inflationary pressures). Asset prices have collapsed, and household wealth has shrunk. Paradoxically, Nigeria’s rank on the Corruption perceptions index remains unchanged at 136th position out of about 176 countries, while its ranking on the Fragile States index has worsened from the 17th and 14th positions in 2014 and 2015 respectively to the 13th position in 2016 (down from 54th position in 2005). Many economic agents have lost count of how many exchange rates operate at the same time. The overall direction of macroeconomic policy was largely more of the same. On fiscal policy, FGN continued to spend over 100% of its revenue on recurrent expenditure (as done by previous government) while borrowing ALL its capital expenditure. There remained half-hearted commitment to deregulation of petroleum pricing as well as privatization of refineries. The budgeting framework remained largely the same, with all the institutionalized inefficiencies (recall the ’budget padding’ scandals). Monetary and exchange rate policies were in their own world. Let me make a point that most analysts miss namely, that in domestic currency terms, the economy is in a recession, but that in US dollar terms, the economy has suffered massive compression. Depending on the exchange rate used, the size of Nigeria’s GDP has shrunk from about US$575 billion when the current government took over to anything ranging from US$354 to US$232, and Nigeria has again lost the first and second positions in Africa’s GDP ranking. At the interbank rate of about N375 per dollar, the GDP is probably around US$288 billion but if we use the parallel market rate of about N465, then we are closer to US$232 billion. Think about this: in the previous 16 years, Nigeria’s GDP more than doubled in US dollar terms. In less than two years, the current government has managed to reduce the size of GDP in dollar terms to about 50% of what it met. We will get out of the recession any moment from now— with oil price and output rising—but it will be a miracle if the government is able to return the GDP in US dollar terms back to the level it met it even by 2023! I must congratulate the government for plugging some of the loopholes and stopping some of the bleedings. The challenge however is that much of these have focused on the MICRO: while trying to tie down the chicken, we are either stopping the cows from coming in or chasing them away. For example, while we are fixated with stopping the import of toothpicks and stopping the petty traders from taking dollar cash away, we have created havoc that have shut down many factories and with low capacity utilization, as well as ignited massive capital flight and halted capital inflows— with the attendant impoverishment of millions, escalating unemployment and inflation, etc. Put simply, we have missed the MACRO picture! While we are winning selected micro battles, we are losing the war on the MACRO economy. In November 2015, I argued that the policy direction of government was inconsistent with its stated objectives of economic growth, job creation and poverty reduction, and that if it insisted on controlling price (exchange rate and capital controls) the way it was doing, the real economy (quantities) would adjust/contract with vengeance. I further warned that incomplete or dysfunctional adjustment would be costly. In a matter of months, Nigerian economy was plunged into an avoidable recession. Naturally, most people never admit their errors—but rather point to other “external factors”. The last PDP government was blaming “external shocks” while the current APC government blames not only the fall in oil price/output but also the past PDP government. No one admits of policy errors, and that is the problem. Have we learnt any lessons from the experience so far? We ought to, but I am not sure we did. One lesson we ought to have learnt is that we sought to re-write macroeconomics for Nigeria but sadly, the hapless millions of Nigerians have been the unfortunate Guinea pigs. A lesson is that the claim to Nigeria’s economic exceptionalism is false. Nigerians, like economic agents everywhere, respond to incentives and sanctions. Furthermore, the pseudo-intellectualism framed around infantile but insular nationalism does not offer a practical template for prosperity in the 21st century. It merely massages our emotions, offering no pragmatic action plan. Another lesson is that Nigeria has refused to learn from the history of boom and bust cycles in oil/commodity prices. The current government is responding exactly like some did in the past: treating oil price/quantity fall as temporary while treating a rise as permanent/normal. It is merely embarking on short term demand management—just as “coping strategy” while waiting for oil price/quantity to return to “normal” and we get back to business as usual. Every government (except those forced by external agencies such as the World Bank/IMF to undertake painful adjustments) have always skirted around the margins when faced with negative shocks and passed on the hard decisions to the next government. Every government since the 1970s has lamented a lack of diversification of export and fiscal revenues but there has been no coherent strategy for a post-oil economy. Is it the Plan for Transition to a Post-Oil Economy that Nigeria has been waiting for? First, we must commend the FGN for this major effort. I will undertake a detailed evaluation of the Plan in the future. To motivate discussions here, let me raise just two or three points. Whose Plan is the ERGP? This might sound trite but that is the issue. Ownership will determine whether the Plan is just a public relations document or will be implemented. I have seen a Plan where the President, in his handwriting constituted members of the drafting committee, commented on every page of the draft and even wrote some pages himself; spent 90 minutes every week at a meeting with heads of all economic MDAs to coordinate implementation, etc. There was the National Reform Council that included leaders of the National Assembly, leaders of the ruling party, etc. As a change Agent, APC intend to cleanse our closet to halt the dangerous drift of Nigeria to a failed state; with a conscious plan for post-oil-economy in Nigeria. To achieve this laudable programme APC government shall restructure the country, devolve power to the units, with the best practices of federalism and eliminate unintended paralysis of the centre (APC Manifesto). All previous Plans (see all the national development plans since the 1970s, SAP, NEEDS, Vision 2020, etc.) have all promised to diversify away from oil. How is ERGP different? (I read the Section on “ERGP’s New Approach”, and I am not too sure of the claims). Where is the new structure of the country that will deliver the new Plan? Where are the best practices of federalism that will eliminate the paralysis of the centre— and alter the incentive system and drive competition in a post oil world? How will you transit to the post oil economy when the Plan is designed to intensify dependence on it and other primary commodities—agriculture and solid minerals? Or are we trying to repeat the same thing over and over and hoping for a different outcome? b) Macroeconomic Framework as a Wish or More of the Same? Some of the figures in the real sector and fiscal accounts as presented in the Plan are surprising. Except I am missing something, the numbers largely do not add up. Also, they are certainly inconsistent with the objective of moving to a new economy. Given the LEVEL of prices and GDP at market prices, the level of revenue/expenditure (about 3% of nominal GDP) or even declining capital expenditure (perhaps around 0.5% of nominal GDP), constitute a drop in the ocean. When the planners therefore state that “growth will be driven by fiscal stimulus. I wonder what exactly they mean by fiscal stimulus— with a budget of 3 – 4% of GDP? When you think of these figures in real terms and for an anaemic economy, there could be cause for concern. The private sector ought to more than double its expenditure/investment to fill the slack. How will this happen with low domestic savings and reluctant foreign investors? Needless to say, that the envisaged 15 million new jobs to be created during the Plan period is a nice wish. The growth vis-à-vis job accounting does not support such a wish. Up until 2018 (the last effective fiscal year for the current government), the Plan envisages to continue the practice of the last government of borrowing to finance recurrent expenditure. The deficit will continue to exceed the capital budget, meaning that every penny of capital expenditure will continue to be borrowed as done by the last government. So, what has changed? We do not see a clear program of action on what to do with the over 520 federal agencies and parastatals. More fundamentally, the Plan talks with tongue in cheek about “improved implementation of a flexible foreign exchange rate regime to support growth”. On external balance, it talks about “expenditure switching policies to promote exports. Interestingly, there are no projections for the trajectory of exchange rate or foreign reserves. This is the elephant in the room. Let me say that in the context of any serious transition Plan to a post oil economy, the exchange rate regime, including a target path for a competitive real effective exchange rate (REER) will be decisive. It is not the silver bullet but like the advert for the American Express, ‘you don’t leave home without it’. Attracting the badly needed foreign savings/investment as well as diversifying into competitive export-oriented industrialization will not happen without a competitive REER. You cannot accumulate foreign reserves on a sustained basis without it. The rapid accumulation of forex reserves and massive FDI and portfolio inflows in the period 2004- 2008 was not an accident. 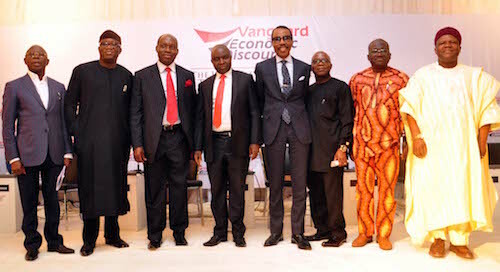 Take out the excess crude savings from our reserves, and one would see that the CBN’s component of the reserves grew very rapidly during this period ostensibly because we deliberately targeted to ensure that Nigeria avoided the Dutch disease syndrome (over-valuation of the real effective exchange rate) when oil price was rising. The IMF complained that the Naira was undervalued and pressured us to sell down reserves to mop up excess liquidity. We refused, and convinced them of the logic of our actions. If we had not maintained an undervalued REER, the nominal exchange rate would have been around N70 -N80 but reserves at no more than US$20 billion (instead of $54 billion) at the start of the global financial crisis in 2008. The story of the Nigerian economy would have been a totally different one, and perhaps by now the Naira exchange rate would have far exceeded N1000 per dollar. This is a subject for another day. My key point here is that the macroeconomic framework will remain dicey until we remove the huge uncertainty and opacity surrounding our exchange regime. The Plan as packaged is a good effort, but in terms of our expectations as a Plan for transition to a post oil economy (as promised by the APC), it is a missed opportunity! It is a generic plan, and in several aspects resembles the NEEDS document (designed for a different era) with some tinkering. It is a plan to consume the oil and commodity rents and not one to restructure in order to replace them. With rising oil price and output, the economy will recover and grow but in spite of the plan and not because of it. It will take the next oil/commodity shock for us to lament that we should have had a Plan to transit from oil/commodity dependence. I am willing to bet that not much will happen in terms of the structure of the economy or the structure of fiscal and export revenues at the end of the plan. The Plan’s claim that by 2020 Nigeria would have made significant progress towards achieving structural change with a more diversified and inclusive economy is also a nice wish. If only we know precisely how to measure if we made “significant progress”! The next Plan will probably start by stating that this Plan failed to restructure and diversify the economy or achieve an inclusive economy. Every Plan however is a life document. Perhaps before it goes into full implementation, there is a need for Extended ERGP or ERGP Plus Plus! Conclusion: There is no doubt that the current FGN and most of the state governments mean well for Nigeria. However, the road to hell is always filled with good intentions. We have wasted too much time trying to reinvent the wheel and Nigerians are paying for it. It is never late to make a fresh and strong beginning. Our development path bypassed competitive industrialization which is sorely needed in the transition to a post oil economy as well as to provide jobs for the millions of youths. But crafting and implementing a Plan to steer a totally new direction in a society already numbed by easy life from oil rents is not a tea party. Furthermore, politics is around the corner and easy populism will stand in the way of the hard but painful choices that must be made for a new economy. Politics of survival will dictate business as usual or mere tinkering at the margins as we have seen so far. What Nigeria needs at this time is statesmanship politics: men and women ready to pay a huge political price to fundamentally lay a new foundation.